Datalogic Memor Wireless - Mobile Computer (Windows Mobile 6.1, 802.11, Bluetooth, Standard Laser with Green Spot, 23 key Numeric). Includes standard battery, US power supply, mini USB cable, SDK and Wavelink Avalanche. The Memor is a small and slim mobile computer with excellent ergonomics for single-handed use. The Datalogic Memor is provided with rugged construction to survive unintentional drops and exposure to water and dust. The Memor is provided with rugged construction to survive unintentional drops and exposure to water and dust. The pocket-sized mobile computer Memor is a real innovation on the market with an industrial standard OS, a mature and stable architecture, large memory on board, a user accessible SD card slot and an integrated WLAN or WPAN. AC/DC Power supply, Direct Charge Dock, EU/USA Plug, Compatible with Memor Series. 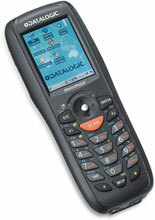 The Datalogic 944201014 is also known as Data Logic	DTL-944201014	.